I made the masculine card today. My stash of cards definitely needs more masculine cards added to it. The men in my life are definitely into fishing so this image adds the perfect touch to a card for one of them. This image is from Some Odd Girl called "Fishin Tobie". You can find this image here. I am entering this card into the Some Odd Girl "Bling it up" challenge. Oh my gosh, I am so honored that this card was picked as a Some Odd Girl Favorite!! Super cute card! Love the coloring! I am so glad to see more masculine cards! Love it! Such a cute image and great coloring (I'm so jealous). Love the added fish. Such a great card. Thanks for joining the 'no floral embellishments' challenge at Crafty Cardmakers. Wow Dawn, this is absolutely fab! 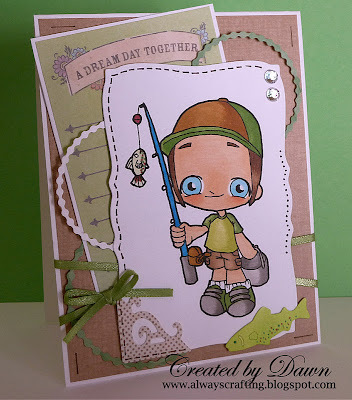 What a great card, so cute and so beautifully colored, love your layering and great papers. Thanks for joining us at Crafty Cardmakers and good luck. Thank you for join in on our card Challenge. Another GREAT card. Good Luck in the Challenge and we hope to see you again soon at Cards For men.